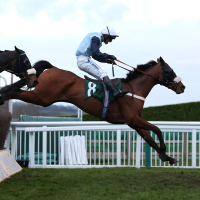 Great Britain avoided a whitewash on the third day of the Cheltenham Festival when Missed Approach made virtually all the running in the Fulke Walwyn Kim Muir Challenge Cup Amateur Riders' Handicap Chase. The 8-1 shot, trained in Upper Lambourn by Warren Greatrex, pulled out all the stops for Noel McParlan to see off two Irish raiders and land the spoils. Missed Approach went one better than last year when he finished second in the National Hunt Chase. Pat Kelly's Mall Dini, the 4-1 favourite, put in a strong challenge but Missed Approach held on doggedly by half a length. Gordon Elliott's Squouateur was five lengths away in third, and Double Ross fourth for Nigel Twiston-Davies. McParlan, who was claiming a first Festival winner, said: "This is very special. I never thought this day would come. "He stuck his head out and galloped all the way to the line - very simple. "All my lad does is stay and stay." Missed Approach was having a first start since he underwent a wind operation in February. Greatrex said: "He's given him a peach (of a ride). "This horse this year has annoyed me because he's a good horse - he just hadn't got it together. "He stays, he jumps and he's brave. "The owner wanted to go to Uttoxeter on Saturday for the Midlands National but I persuaded him to come here. He might go for the Scottish National."